Cuban Revolution, in American Tobacco, is now serving gelato (and at least one flavor of sorbetto). It's a mere hop, skip and a jump from my cubicle. They don't close between lunch and dinner. Danger! Danger! It's very good. I tried the blood orange with the chocolate and that was an nice combination. It was extremely messy and it dripped everywhere, but it was worth it. I suspect my team will spend a lot more time there now. This week, Blu Seafood and Bar had their annual Lobster Night. Actually, they had a extended version, both Wednesday and Thursday nights. My MFRs and I had delicious lobsters and I was proud of how much meat I got out of the body, behind the little legs. It's easy to give up after the claws and the tail, but I was determined to get every little morsel. I'm positive that making so much jewelry, strengthening my hands, made this much easier. I'm guessing you have all seen lobsters before and you can correctly assume that mine was big and red. What you might not have seen before is Blu's lobster salad, which they were serving this weekend. It was a half lobster with prosciutto, avocado, tomatoes carpaccio, with a cream dressing. When, days later, you're still exhausted from taking apart a whole lobster, this salad really hits the spot. I hope I get to have this again soon without waiting for the next annual event! Blu has a new summer menu. I was relieved once again that Oyster Rockefeller was still there. Above, you can see the latest version of the salmon, with couscous, cucumber relish and feta. My 2nd MFR had this in between his regular servings of pork tenderloin. The heirloom tomato and watermelon salad is back! I think I started eagerly asking Chef Tim Lyons about when this salad would return back in January, just in case watermelon and tomatoes would be in season early this year. It's such a great combination of my favorite things, with goat cheese and a balsamic glaze, too. Proportionally, there are very few greens at all. It's just the way a salad should be! Blu also recently had a special appetizer of fried clams with an ancho chile cream sauce. It was incredibly good and I think I even liked them better than fried oysters. It's been just over 24 hours since I was there, but I'm already eager to go back. I need to have the pecan-encrusted trout with orange brown butter sauce again. 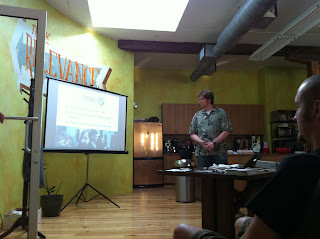 Last Friday night, I went to the inaugural meetup for Triangle Hackerspace. 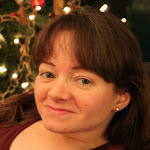 Several of you have asked me about it, so I thought I should write a bit more. Basically, the idea is for interested people to get together and find a suitable location to create a place to hang out and work on projects together. Based on the 40 to 50 people who attended the first meeting, I suspect that when it gets off the ground, most of projects will mainly be electronics and software based, but probably not all. I think it's a neat and inspiring idea. The leaders of this group are Alan Dipert (pictured above) and his wife, Ashley, who recently moved here from Rochester, NY, where they founded the hackerspace, Interlock. It's encouraging that they've done this before, because they should have a good idea of what works and what doesn't. They were eager to try organizing another hackerspace here after seeing the overwhelming success of Maker Faire NC, last April. At this stage, the group will meet weekly to get to know each other and to find out who is really interested in participating and contributing to the effort. The next meeting is this Thursday at 7pm, at the Stanford L. Warren branch of the Durham Public Library. You can also find out more information at the Triangle Hackerspace website, follow @trianglehackers on Twitter or even join the #trihack IRC channel on freenode.net. I also have to mention that the first meeting was hosted by Relevance, which has an absolutely beautiful space on the second floor of the same building that contains Dos Perros. It has lovely sponged yellow walls and the light streams in from several windows and skylights. The next Refresh the Triangle will be held there on August 26th at 6:30pm. It will be a talk on rapid prototyping by John Long, so I'm looking forward to it. A week ago, my 2nd Most Faithful Reader and I went to see Joan Baez perform at the North Carolina Art Museum's amphitheater. When I bought the tickets, I thought it was a bit of gamble, because it could have easily meant enduring a sweltering 100 degrees and and 99% humidity or the risk of a severe thunderstorm. Instead the weather was as glorious as Baez's singing. It was still a bit humid, but in the high 70s and breezy. This was the third Joan Baez concert I'd been to, but I probably had the best view at this one, because the general admission handicapped seating is a flat platform just above the reserved seats, so there wasn't a chance of someone's sitting or standing in from of me to block my view. Parking was a bit of a hike, but everything is sandy or paved and flat, so it wasn't a problem. I'll have to keep an eye open for more concerts there, because it was really a nice experience. It would be hard to beat seeing Baez, though, since she's one of my favorite singers. As always, she sang a few of her newer releases, but also plenty of Dylan's, her originals and traditional folk music. My 2nd MFR took several photos at the concert and maybe someday I'll upload more of mine. This morning I went outside to feed my dear gray wreakers of havoc and smelled one of my favorite fragrances. The Osmanthus fragrans is blooming again. If you're looking for an fairly innocuous looking bush to plant in your yard, then I heartily recommend this one. It's perfect for planting close to a window that's opened frequently, because the heavenly scent just wafts in, particularly at night. I think it smells like apricots or peaches, but better.